Last month I was lucky enough to travel to Germany for the first time, and spent an evening staying with friends in Berlin. I had a terrible cold, but was determined to try some authentic German cuisine, so they took me out to their local pub. This isn’t a trendy, on the foodie-map venue (there are no English menus), but it was exactly what I wanted to try. 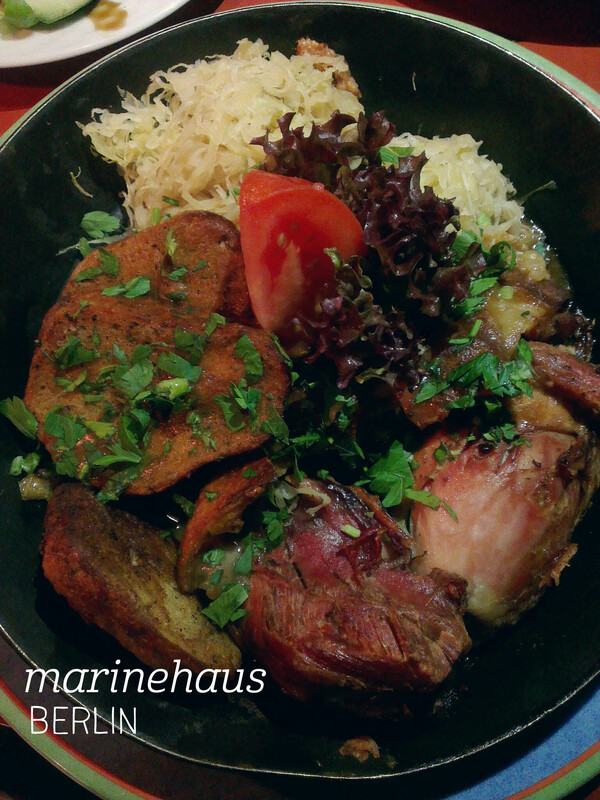 Seated in the nautical-themed space, I ordered the Berliner Haxenpfanne (EUR 12.99) – hello pork knuckle. The plate was huge, and packed with both meat and sides. The pork had been stripped off the bone, and whilst a bit tough and dry on the outside, was beautifully tender and tasty on the inside. I was particularly excited by the large portion of saurkraut (one of my favourite things), and found it pretty much the same as the sort you get in Australia. The small amount of lettuce and tomato in the middle was a nice relief from the heavy dish, because the next thing on the plate was semmelknoel, a kind of bread dumpling that, in this case, resembled roast potatoes. The dumplings had a fun, spongey texture and were nicely seasoned on the outside. Perfect for a freezing Berlin night. 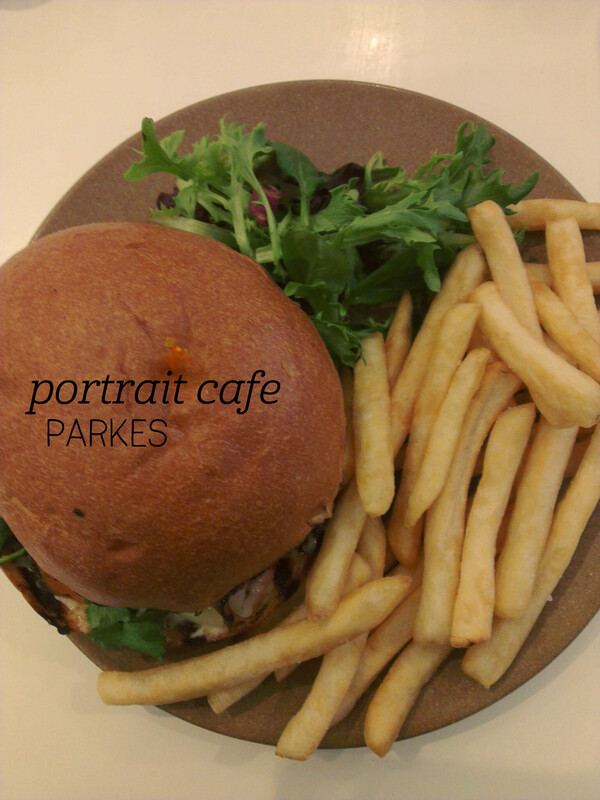 I was so impressed by the variety at the Portrait Cafe that I really struggled to pick only one things for lunch – gourmet pie? Beetroot risotto? African stew? They have it all! I ended up going for something more classic – a Cuban sandwich ($15) with grilled ham, pork belly, sweet potato, gruyere, onions, pickles, aioli and mustard. Yeah, that’s quite a lot of delicious things packed into one sandwich. Luckily they all went together perfectly – pork is a perfect meat to pair with slightly sweet things, so the soft sweet potato and the sweet burger bun complemented the double pork hit perfectly. The pork belly had so much flavour and the saltiness from the ham was amazing. I’m also a bit aioli fan, so really this was a winner on all fronts. I hadn’t realised it also came with chips, which were nicely cooked (perhaps a tad soft for my taste) and generously heaped onto the plate. This was a great value, delicious lunch, and whilst I couldn’t finish all of it, I’d definitely come back to try some of their more exotic offerings. Gondola Gondola is my new happy place. I started with the Weaboo cocktail ($18) – rum, yuzu liqueur, nashi pear shrub, lime, mint and soda. This drink was basically refreshment in a glass, well-balanced and perfect for a hot day. Up first was the salt and pepper bean curd ($12), fried so lightly that it formed the thinnest, most perfect skin over the soft curd inside. It’s super salty (in a good way), and the salad it’s served on packs some heat and epic ginger action! There were a generous 6 pieces to enjoy. Next up was the banh xeo (Vietnamese pancake, $22) with pork mince, prawn and sprouts, served with lettuce, purple leaves, mint, coriander, carrot and pickled cabbage. Whilst it looked big, this was a fairly light dish – a bit like san choi bao in that you wrap the ingredients in the lettuce and add sauce. Messy, but a great mix of textures and flavours – the coriander in particular brings it all to life. 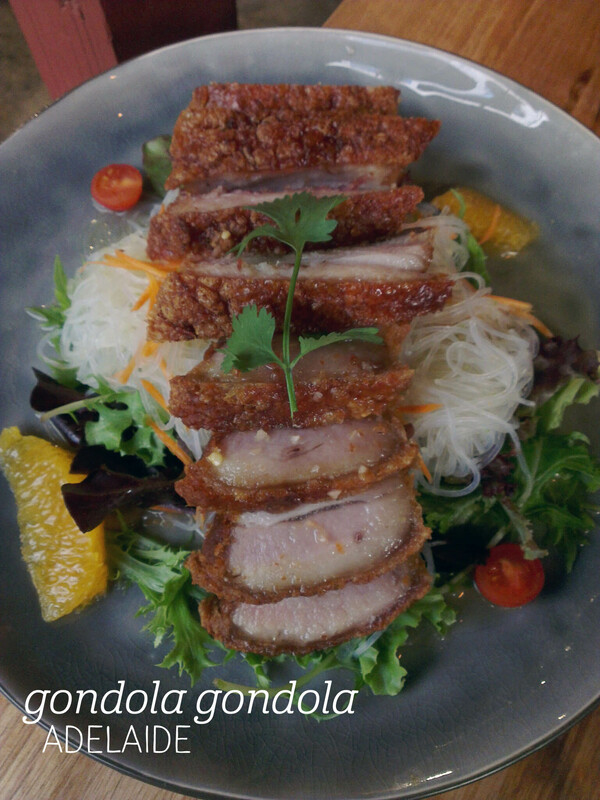 Finally, we had the bun cha ($22), which was our pick of the night – the pork was utter perfection, with a super crispy skin and tender meat, plus the noodles were fabulous! Everything here is packed full of flavour and perfect – take me back! 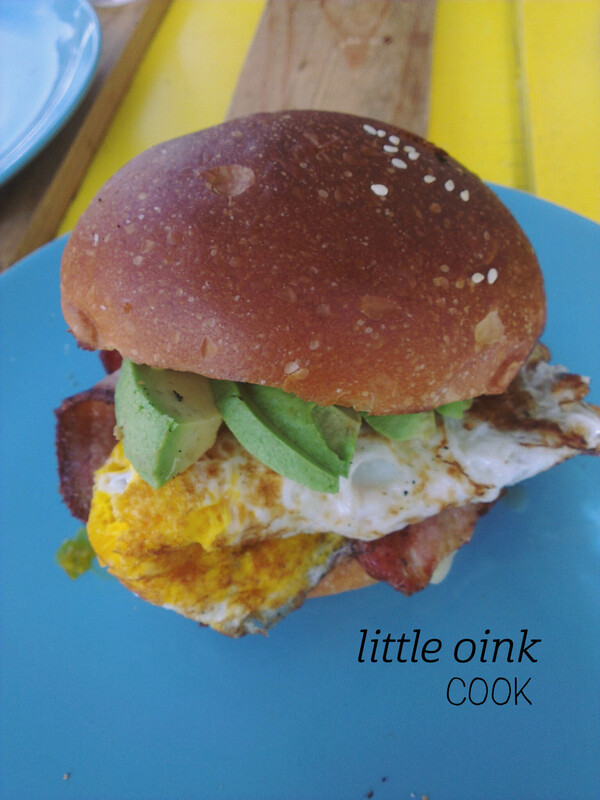 Three friends and I adventured out to Cook in Belconnen to try Little Oink, known for its cute decor and pork-themed menu. We sat outside, and my seat had company – a lovely life-sized pig statue leaning on the bench, joining the conversation. We started with drinks – coffee for my friends, a soy hot chocolate ($5) for me. Whilst not Surry Hills-good, the hot chocolate did taste of chocolate rather than just soy and came with two marshmellows – yum! After admiring the fun menu item names (om-nom-nomlette, for example), I opted for the Jordo – a brioche roll with bacon, two eggs, cheese and tomato relish ($12), and added extra avocado for $3. The food took a while to come out, but they did serve all of our meals shortly after one another, so we didn’t mind. I had to chase up the extra avocado, and when it came out it was a reasonable serve, probably half of a small avocado. The bun was packed full – there was a lot of bacon inside and it had a really great flavour. The eggs were fluffy and cooked through, and the brioche was just the right amount of sweet. We lingered afterwards and weren’t rushed – a lovely quaint spot. Mama’s Buoi sucked me in with its pretty menus – they’re repurposed old-fashioned photo albums with bright covers. Opening them just confirmed that this would be a good experience. I was dining alone for this meal, and the wait staff, while not super fast, were attentive and friendly. I started with a delicious lychee and gin cocktail, which was bright purple and served in a martini glass – I loved the slightly sweet, fruity flavour and sipped it slowly over the course of my meal. 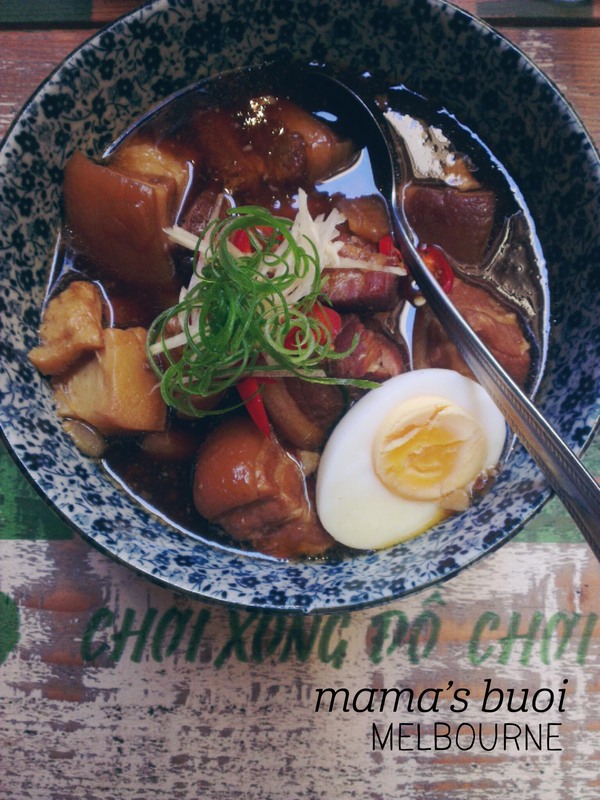 To eat, I ordered the Thit Kho – a caramelised pork belly hot pot. Mmm. The serving arrived in a lovely bowl and came with a large portion of steamed rice. The pork was fatty and tender, and it had absorbed the flavour of the stock, making it quite sweet. There was one flavour that I didn’t like amid the mix (might have been bamboo?) but I could mask it with the onion. I really enjoyed the stock, which I put onto my rice, but I couldn’t finish the bowl by a long shot, so this could be a good one to share. I’d love to come back and try their pho and grilled dishes. When pondering what to eat for dinner, ‘a whole suckling pig’ isn’t really a common option. When your friends are moving to Indonesia, suddenly this becomes possible. 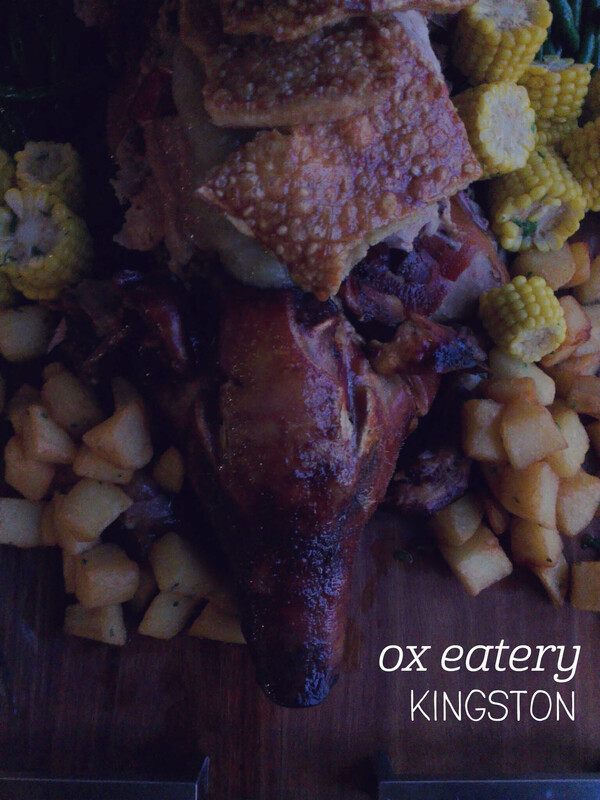 We gathered a group of twelve together for the farewell and booked in for a suckling pig feast at Ox Eatery. When the pig came off the spit it was quite the spectacle – the chef carved the animal with a giant cleaver and reconstructed it on the largest serving platter I’ve ever seen, piling the meat up high and creating a shell of crackling. The platter was brought alongside our table and potatos, steamed green beans and corn has been added around the pig. We got stuck in – the crackling was served cold in thick, crispy slices that everyone happily ate with their hands. The pork itself was incredibly tender, and had been coated with a light apple sauce that added a hint of sweetness to the meat. Each of the accompaniments were delicious – the potatos were deep fried and perfectly soft inside, and both the beans and corn were beautifully buttery. Whilst we couldn’t finish the pig, it was certainly a meal to remember! Normally I’m not really a sandwich/roll kind of person. I’d much rather eat the filling itself as 100% of the meal, rather than 40% filling and 60% bread. However, my Dad was so excited to go to a pork and crackling-themed place when we were in Sydney that even I started to consider how good a roll jam-packed with meat could be. 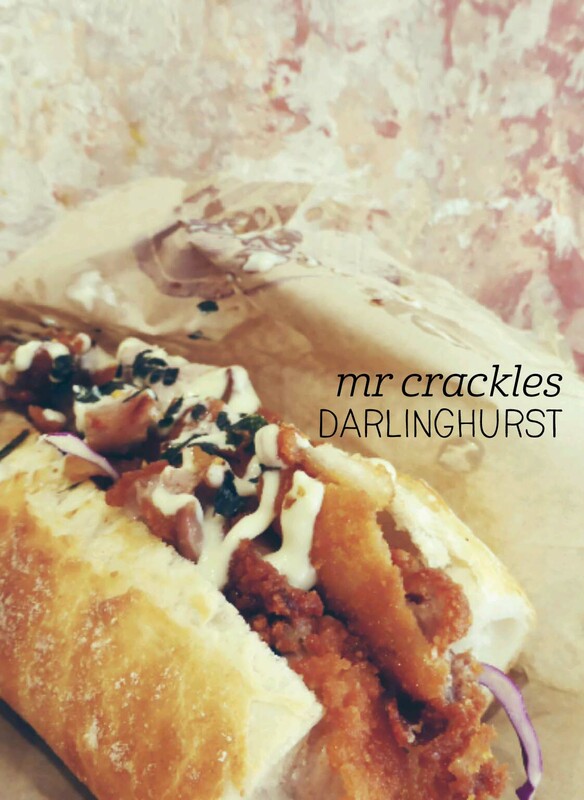 Mr Crackles is a small store that caters largely for takeaway, but which has a couple of seats for dine in. I opted for the ‘chicken katsu’ roll with a cup of crackling. The roll is quite substantial, and yes, the filling-to-roll ratio isn’t quite as good as I’d like, but it was better than 2:3. The filling had a bit of bite with wasabi mayonnaise mixed into the coleslaw. The chicken was lovely and crisp on the outside and tender inside, and in reasonably sized pieces. The cup of crackling was generously sized, although I’d expected it to be served hot and it wasn’t – it was a bit tough to break to share, but was very tasty. I’m not entirely converted to rolls, but food coma aside, I’d definitely come back to try another one.